Earlier this week I heard about a special report on Lifelong Learning in the TheEconomist, so I scrambled around looking for a copy in the book and convenience stores in the area – without any luck. It was Martin Luther King Day so I had the day off. So, to get the six articles, I went through the laborious effort of going to three different browsers to print them out (because I do not have a digital subscription). Why the adventure? I have had subscriptions of TheEconomist in the past. (I was as an economist once in my life.) The magazine always produces thought provoking articles with a good story-line. And more importantly, lifelong learning is one of the themes of Skills-Based Approach – a methodology and application I have been working on for years. I see skills in all forms – technical, transferable, thinking, soft, and behaviors – and related skill competencies as a way to bridge learning expectations. 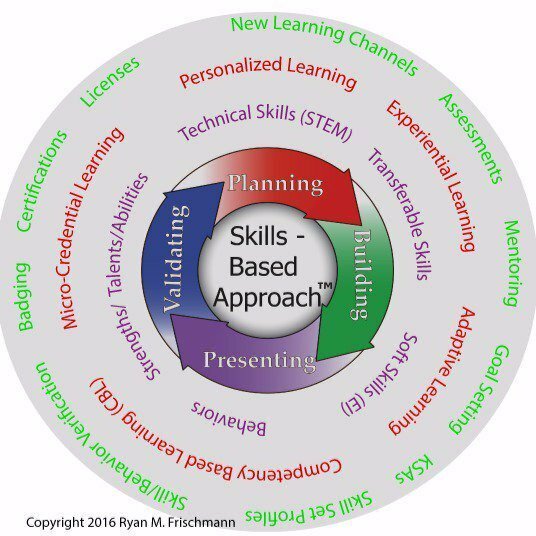 Skills work laterally across subjects and disciplines, and vertically across education and career stages. I have suggested thinking in skills with lifelong learning near the conception of Skills-Based Approach. The methodology suggests constantly cycling through four stages with an evolving skill set throughout an education and career. There is pressure on jobs from automation – forty-seven percent of jobs are susceptible to AI. New technologies and applications are changing rapidly which reduces the shelf life of current technical skills. Professionals must add breadth to their skill set (uses the example of having a marketing professional being asked to create an algorithm). Skills-Based Approach addresses each of the conclusions: 1) Professionals target soft and analytical skills that are not easily automated; 2) Professionals anticipate and respond to future demand from skills. For example, a database designer may see the adoption of a particular database application rising in the next couple years, so he starts to learn the application; 3) Professionals add any skill to their skill set and move through Skills Based Approach to acquire a competency. One article was about the credibility of MOOCs – free online courses, usually from top universities. There is a lot of upside with MOOCs. The obvious and immediate thought is taking a MOOC allows students to explore personal and professional interests. There is little stake in trying them; the courses are free and you can stop taking them at any time. But, as the article points out (and something I have harped on), a MOOC or a series of MOOCs (called a specialization in Coursera) is a credible way of learning and should be compared to courses taken in the traditional way. I remember reading about how top performers in a MOOC targeting high demand skills get recommendations from the professor and might even get a job offer. From my own experience, I can attest to the quality of the teaching and learning, benefit in having a national (often international) audience, and the flexibility of interacting at any time. I took Content Strategy for Professionals 1: Engaging Audiences for Your Organization from a cadre of professors and guests at Northwestern; the first MOOC in a series. After taking the series, a person who performs well could step in to a marketing role at a company regardless of his or her previous education – in my opinion. In the article Pathway Dependency Turning Qualifications into Jobs, the author talks about learning paths where education is combined with vocational training – something he defines as boot camps, nanodegrees, and apprenticeships. This is something I usually refer to as micro-credentialism, where you learn precisely what you need by targeting specific skills. You work with future employers to determine the technical skills you need. The best way to target the high cost of education is to develop these learning pathways that shorten the time and often expense for students. As higher education institutions adopt competency based learning (“CBL”) and micro-credentialism, it will become less of a one or the other decision. I find it interesting that America “lacks a tradition of vocational education” as compared to counterpart European and Asian countries. Clearly, there is an agenda for change in America. There is a significant rise in CBL, apprenticeship grants, coding boot camps, and employer sponsored learning programs. Build Foundational Skills. The article talks about ‘design thinking’ with an example of how a company deliberately practices the methods of this skill. This is something I have talked about with Skills-Based Approach; there is a need to work with the underlying methods and application of these types of skills. Focus on Social Skills. AI and applied technology is supplanting job requirements at all levels. Social skills are not easily replicated, so will remain highly sought after. Have a Growth Mindset. Continue Learning. I promote a Skills Culture , which basically says “you can learn a skill if you put in the time to learn it properly” – the sentiment was captured in a survey I conducted, where the majority of respondents agreed with the statement. Skills-Based Approach is the methodology and platform to address the needs of a lifelong learner. It puts students and professionals in the ‘driver seat’ of their learning and lets them proactively manage their growth.